Updated in April 2019 for the 2019-20 program year & updated in May 2018 for the 2018-19 program year. Verification is the process used by the institution to check the accuracy of the information the student and, in the case of a dependent student, the student’s parents, provided when applying for Title IV federal student aid via the Free Application for Federal Student Aid (FAFSA). Information is verified by obtaining documentation, including in some cases, a signed statement or worksheet attesting to the accuracy of the information. 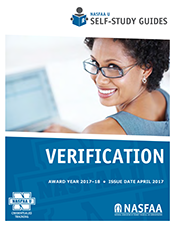 Verification ensures the accuracy of data used to establish eligibility for need-based federal student aid. This guide will explain the various aspects of verification and the documents required to complete the process. Understand verification documentation requirements for each data element. Professional judgment and the authority to utilize it. The policies and procedures a school should have in place regarding verification.